Will the iPad3 offer anything new for Tablet users? What are consumers looking for? In the coming weeks, the world will be abuzz with shiny new unboxing videos of fans getting their hands on the latest iPad by Apple. Speculation is rampant about the range of technology innovations that may/should be included in this latest iteration of Apple’s redefinition of mobile computing. The question is, what do consumer expect from their tablets and will the iPad 3 deliver on these expectations once they get past the hype about 4G radios and HD screens? To help answer that question and more Argus Insights has crafted an infographic based on what we saw of tablet users in 2011, enabling us to peek around the corner into 2012. What patterns will you use to transform the user experience? edictions on whether 3 will outperform 2. Contact us for more information or if you’d like the infographic as PDF. 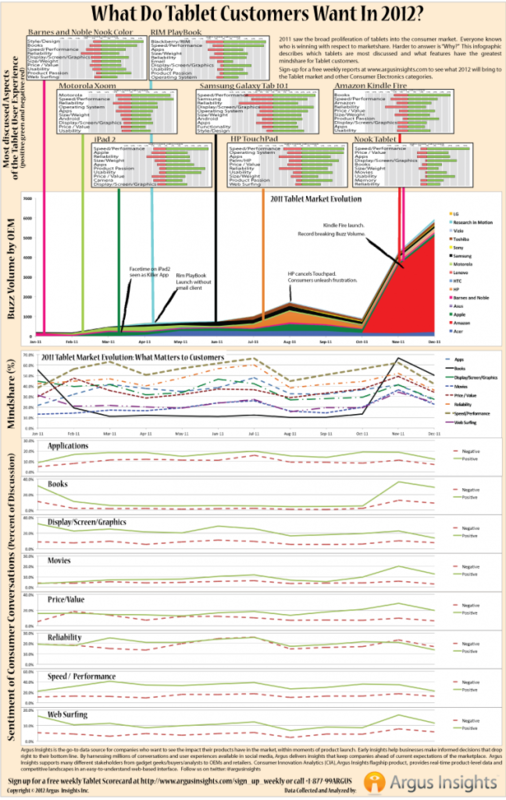 Plan for 2012 by understanding how tablet users reacted in 2011 to the launch of the iPad 2 and the Kindle Fire.